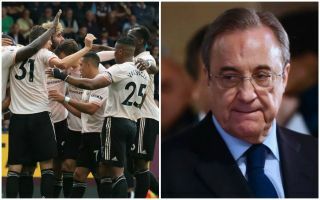 Real Madrid president Florentino Perez has reportedly been given hope of beating rivals Barcelona to the transfer of Manchester United midfielder Paul Pogba. According to Don Balon, the Spanish giants’ chief may have become aware of the fact that Pogba has a truce of sorts with United manager Jose Mourinho not to push for a move away until next season. The piece explains that Perez seems confident this gives him more time to change the France international’s mind about joining Barcelona after links with the Catalan giants this summer. Pogba could clearly fit in well at either of these major European super-clubs, having shown himself to be one of the finest players in the world in his position on his day. Having caught the eye at Juventus, Pogba rejoined United in a big-money move in 2016, but has never really looked quite the same player in his time in the Premier League. The 25-year-old doesn’t seem an obvious fit for the demanding and conservative-minded manager Mourinho, but showed with his form at the World Cup this summer that he can dominate games when given a bit more freedom to express himself. Pogba would likely find that easier at clubs like Real and Barca, where there’s always pressure to play expansive and ambitious football, as well as having the vastly less competitive La Liga in which to strut your stuff against most lower-level teams in the division.